Ayn Rand Institute board chairman Yaron Brook has appeared many times with Dave Rubin — both on The Rubin Report and at various speaking events — to discuss the unique value that Objectivism brings to today’s intellectual landscape. 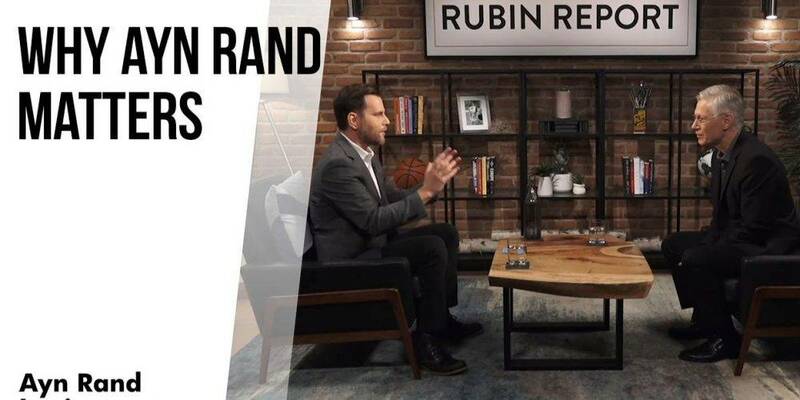 In this installment of ARI’s ongoing collaboration with Rubin, Brook returns to The Rubin Report for a 30-minute discussion focused specifically on the question: Why do Ayn Rand and her ideas matter today? Asked for the two-minute version of his answer, Brook explains that it’s because Rand’s ideas are both revolutionary and inspiring. Rand upheld the supreme value of the individual, says Brook, and was devoted to showing us a better kind of life that we can strive to live. It’s Rand’s vision of what it looks like to achieve a truly happy, fulfilling life that explains why idealistic young people gravitate toward her — even if some, as Rubin notes, abandon her philosophy later in life. Maintaining one’s youthful idealism is a difficult achievement, Brook explains, and some, unfortunately, end up surrendering that idealism and giving up in cynical resignation. Rand’s vision of what it looks like to achieve a truly happy, fulfilling life that explains why idealistic young people gravitate toward her. Asked by Rubin why Rand’s concept of selfishness as a virtue wouldn’t just devolve into dog-eat-dog viciousness, Brook gives a brief but cogent explanation of why being a “lying, stealing SOB” isn’t in anyone’s selfish interest. Rand’s conception of selfishness, he explains, is new — it involves a life of reason, purpose, independence, and self-esteem, not predatory exploitation of others. Watch to the end to hear Brook explain what our political system would look like if Rand’s ideas were implemented in full and why Rand never considered going into politics. Rubin’s focused, pointed questioning together with Brook’s illuminating answers make for a brief but stimulating exchange.